Saudi TV has broadcast photos of what it says is the body of a slain al-Qaeda leader, killed by security forces hours after he beheaded a US hostage. Abdul Aziz al-Muqrin and three other militants died in a shootout in Riyadh after dumping American Paul Johnson's body, Saudi officials said. The operation dealt a "major blow" to al-Qaeda in Saudi Arabia, said a top foreign policy adviser, Adel al-Jubeir. A posting on an Islamist website earlier denied that Muqrin was dead. 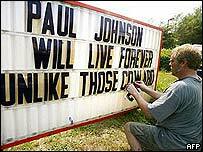 US President George W Bush condemned Mr Johnson's murder, saying it "shows the evil nature of the enemy we face". Speaking at a news conference in the United States, Mr Jubeir said Saudis were "outraged" by the acts of al-Qaeda. The Saudi authorities were still searching for Johnson's body, he added. Saudi officials say the militants were cornered at a petrol station in Riyadh, after witnesses spotted them throwing Mr Johnson's body from their car. A fierce gun battle broke out, in which the four militants and at least one security officer died. Earlier, a purported al-Qaeda statement denied the militants had been killed, saying Saudi claims were lies "aimed at dissuading the holy warriors and crushing their spirits." To refute this, Saudi television broadcast a photograph it said was of Muqrin, the country's most wanted man. Three other dead militants were also pictured, including one, Turki al-Mutairi, linked to last month's siege in the Gulf oil city of Khobar which led to the deaths of 22 people. Saudi officials said they also arrested 12 al-Qaeda suspects. They seized forged documents, a large number of weapons, and three cars, one of which is believed to have been used in an attack on a BBC team two weeks ago. 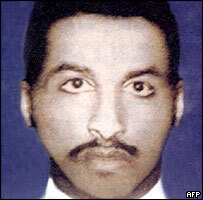 The US ambassador to Saudi Arabia, James C Oberwetter, described Muqrin as "among the most vicious of the current al-Qaeda crop on the peninsula." Saudi government spokesman Jamal Khashoggi told the BBC World Service's Newshour programme that Muqrin's death showed that al-Qaeda was "running out of recruits and staff, as you can see when their leader is involved in basic planning, in dumping a body". The BBC's Heba Saleh in Cairo says Muqrin's killing is a much-needed boost for the Saudi authorities, after a string of high-profile attacks in recent weeks. But she says it is unclear if the violence will subside, as al-Qaeda has vowed to drive all foreigners out of the kingdom and Muqrin is the third leader to be killed in a year. The al-Qaeda cell had told the Saudi government to free jailed Islamist militants by Friday, or it would kill Mr Johnson. "They killed him in cold blood," Mr Bush told reporters in Seattle. "They're trying to intimidate America. They're trying to shake our will. They're trying to make us retreat from the world." Photographs of the beheading were published on a website which has carried Islamist messages in the past. A statement on the site signed by the "Organisation of al-Qaeda in the Arabian Peninsula" claimed responsibility for the killing. "This is God's voice raising in anger... at the treatment of Muslims in Abu Ghraib... Guantanamo and others," the statement adds. The corpse on the website was dressed in an orange jumpsuit similar to those worn by prisoners held at the US detention centre in Guantanamo Bay, Cuba. Al-Qaeda, the statement says, had killed Mr Johnson because of "what Muslims have suffered from American Apache helicopters and their rockets". Mr Johnson, 49, worked as a helicopter engineer for US defence contractor Lockheed Martin in Saudi Arabia. The killing came despite pleas for mercy from Mr Johnson's family broadcast in the Arab world. In May, kidnappers linked to al-Qaeda beheaded a 26-year-old American in Iraq, placing the images of the beheading on an Islamist website. "Al-Qaeda has been knocked back by al-Muqrin's death, but certainly not knocked out"